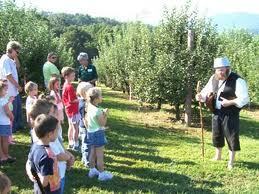 Let us all imagine a modern version of the story of Johnny Appleseed as if he were still alive. Let us imagine that Johnny’s seeds were not just apples but dreams, hopes, and energetic thoughts for a better world. In our story one of his apple seeds grew into a company that he decided to call Apple. This seed was about birthing a platform that would interconnect all of humanity. This tool was called the internet and would allow people across the globe to each plant their own seeds. He imagined a person in the villages in Africa planting a seed on the internet and bringing a smile to someone in Texas. From that seed, friendships and new bonds would be able to grow that were magical. He recognized that humanity could educate themselves in new ways allowing for each person’s interests to lead the way. He saw it as an escape from some of the old ways of revealing news and information in a much quicker fashion. For Johnny had a vision that all of humanity would learn to plant seeds. That people would learn the value of becoming engaged with the collective. That humanity would become engaged in planting their own seeds of hope, joy, and opportunity for a better world. He knew that whether the seed was a photo, a video, a song, a blog, or a full length movie that universal sharing could profoundly change the collective. The seeds he planted were encoded with love and joy and all that feel inspired to share their seeds are encouraged to put the same love and joy into the seeds they plant on the internet. We are no longer just a person behind a computer screen but a powerful weaver of a new tapestry for a new world. The new Johnny Appleseed has changed his hat from a pot to a beautiful halo. He leaves us with this advise; believe with all your might that your seeds of love will grow strong and multiply many times over. The lightworker community is very familiar with words like soon or shortly or in the blink of an eye. To some degree it has created a skepticism amongst us. I say that, that was then and this is NOW. I want to offer up a heart centered challenge to all those helping build our new world. Forget all other predictions about a schedule for Abi-Quor and let’s co-create a new one as the masters we are. But, but, but you can’t do that, they told us so and so. Are we not powerful co-creators able to set our own schedule? The collective consciousness can not only move mountains but it can create cities ahead of schedule. Enter divine will and divine timing. Thine will be done not mine. Can we not align our desires with the divine to bring about an earlier date? It is my feelings that as long as we are in alignment with our higher selves and not our ego we could with our collective could help control our outcome. It all starts with our desires and our intentions so let us all plant similar seeds that says Abi-Quor will be completed by the end of 2013. Let us believe it in the depths of our hearts and create this as our reality. Let us send our collective visions strongly out into the universe and allow it manifest in divine timing. We are all aware that time is an illusion and some will prefer to simply allow whatever schedule to simply happen. I am offering a different approach of aligning our desires to create that which we wish. If this resonates with you then I ask that those who are master gardeners to plant your seeds and love them to life. All applicants must be able to imagine beyond 3rd dimensional limits. This requires of applicants to be one of the “crazies” that can see things so differently that they make sense. All training work will be done at home and aboard ships. This is a volunteer position with great benefits. Many are starting to learn about the building of a great space in Pagosa Springs Colorado named Abi Quor. This is to be a center for Leaders of Light to be trained and developed. It is a joint co-created center with the Galatics and earth allies creating it utilizing their powers. These powers include Desire, Intention, Belief, Love, and Joy. It requires the visionaries to place their energies and desires into their creations. This collective will create a place that is beyond today’s understanding. It will be a model for other communities around the world. There is a great desire of the galactics to be able to interact with the earth and it’s people just like there is a strong desire amongst us to interact with them. Their joy includes helping and teaching other civilizations how to better their societies. Abi-Quor will offer that environment. Part of my vision was to establish within Abi-Quor a retreat or resort like environment where Galactics and humans could come to a vacation like environment to experience and showcase the earth as the beautiful place it truly is. Abi-Quor is just the start if the collective wishes more. Other centers will spring up through-out the world that will involve training in such areas as science, exploration, food and health, education, and many others. It requires visionaries around the world. I have planted the seeds of a vision to build an ambassador and hospitality center in Arizona. Can you help energize and build these types of visions? THIS IS POSSIBLE, so do not allow another to sabotage your dreams? Stand strong in YOUR light and vision the change you desire. Ask with your thoughts to join the dreamflights and set your intentions to create with them that which you desire. Let’s help to build the resonance of the collective to be so strong that communities will start popping up around the world. Share with the internet community on this site and others your desires and feel free to think outside the box. Support others as part of the collective with feedback and encouragement. Help build a better world by posting your visions and expanding on them today. I have been asking and receiving permission to nightly to join the Athabantian for past few weeks. My dreams and memories are not as clear as others so I journey relying on my senses. This has been a way of life for me for the past few years and I feel it as a piece of bread being placed on my path by my guides to guide me to my remembering. I have always known that I had a grander purpose and as these times approach the bread crumbs have led me to the Athabantian where I sensed I would be helping in a great project to help humanity. As my time as a crew member increased I learned of my galactic team leader and what I have been doing on board the ship. I relied on my pendulum to help clarify my thoughts. During the night-time when things are quiet thoughts and ideas come to my conciseness and I find myself co-creating and mentally working at my job. The excitement of this sometimes distracts my thoughts for hours. I sense these thoughts and this co-created effort are but more bread crumbs along the trail. I feel I now have a much stronger connection to my crew lead who is called “Yamya” for short and one of the roles I will be involved in I sense will be with a team that will be involved with galactic visitations to Earth. Although others may have vivid dreams to help them find their crumbs I have had to rely on other senses. I am grateful for the challenge placed before the crew members as I feel there is much value in finding your own way home or at least to the next pit stop. I love my time aboard the ship and look forward to my sleep time.